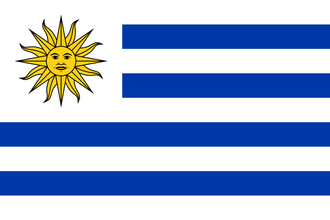 Uruguay is a small country in South America. It is bordered by Brazil to the north and Argentina to the west. Its terrain is only plains. Uruguay, lacking a unique national focus tree, uses the generic national focus tree instead. Uruguay starts with 2 research slots. Uruguay, in 1936 is a Democratic nation. Its elections are every 4 years with the next one being in April 1938. Uruguay is guaranteed by the United States via Monroe Doctrine. Uruguay has 6 civilian factories, 1 military factories and 1 dockyard in the state of Uruguay. Uruguay's oil and steel is in the state of Uruguay. Uruguay has a small military. Their infantry has 4 infantry units each. They have a navy of 1 destroyer. Have a good strategy for Uruguay? This page was last edited on 10 December 2018, at 08:50.